GeoConnect³d aims to provide to stakeholders a coherent geological context for evaluating subsurface applications and resolving subsurface management issues. For this, two concepts were introduced: structural framework and geomanifestations. Besides the database, the geological structures and manifestations that will be used for a range of visualisation levels need to be defined and contextualised, information that can be presented as an accompanying technical vocabulary. Both the database and the vocabulary have to be readable by computers so that the information is transferred to an interface that is accessible to users. 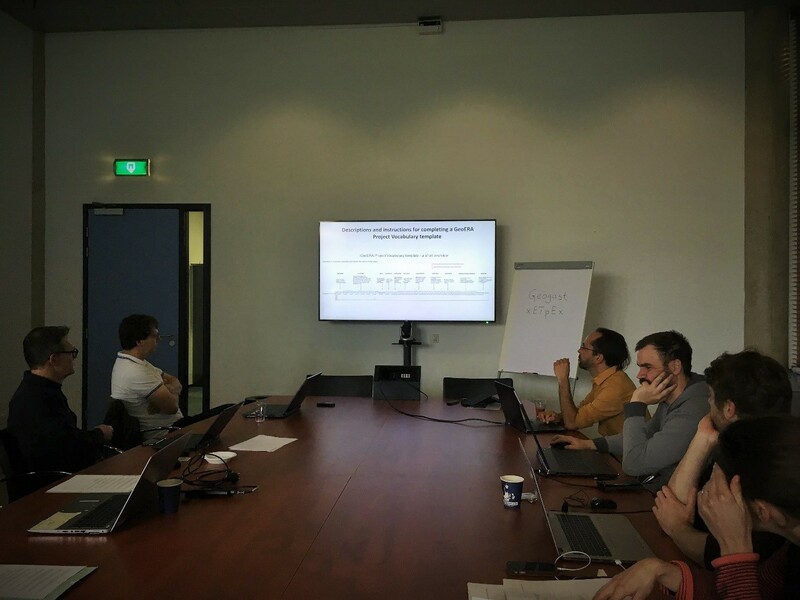 The vocabulary was one of the topics discussed at our structural framework workshop at TNO Utrecht on 2-3 April 2019. Deep thoughts during a roundtable about the project vocabulary at the workshop in Utrecht. We are very familiar with definitions as geoscientists: there are over 40,000 entries in the Glossary of Geology by Neuendorf et al. (2005)! It is obviously very important that the elements that build up a structural framework have to be well defined; it is essential to know whether the units are orogens or grabens (or other), and limits are normal faults or unconformities (or other). For each of the elements there has to be basic defining information accompanied by scientific references. However, definitions are not enough for a structural framework. The elements are related to each other, and these relationships are geologically important features. But the challenge continues: imagine having to ‘explain’ a complex region (for example the Variscan orogen) to a computer, in a way that it gives you a thesaurus with the different units, their limits and different relationships? This complicated task becomes possible if the input information is ranked into a hierarchy and entries are linked to each other through semantic relations. We can ‘teach’ some geology to the computer by telling it which are the major (or broader) limits and which broader units they define, and how the broader limits can be broken down into minor (or narrower) limits that could define narrower units. Another important part of our job is to interpret geological processes, and this is where things can get really interesting as there are usually many possible answers for the questions asked. Categorising and visualising the elements that form a structural framework and geomanifestations databases will intrinsically depend on some interpretations. However, in our task of building a vocabulary for stakeholders, definitions have to be as immutable as they can be, while interpretations may change as the understanding of the concept evolves. This is an important distinction we need to address to guarantee sound information is provided. Definitions, interpretations, references and relationships between concepts can be presented in an organised manner based on data models such as SKOS (Simple Knowledge Organization System), which places information within the framework of the Semantic Web. These data models not only allow for a much needed internal consistency in cross-border projects such as GeoConnect³d, but also make possible to do external links with other projects when useful. If you want to see how a vocabulary like this looks like, the GBA Thesaurus by the Geological Survey of Austria is a great example that has been a guide to us. In conclusion, the project vocabulary provides information about and context to the elements in the database in a way that it is readable by humans, as a thesaurus, and computers, within the Semantic Web. Advancing with the structural framework and vocabulary means we are moving forward towards GeoConnect³d’s ultimate goal of providing coherent, understandable geological information for policy support and subsurface management. Reference: Neuendorf, K.K.E., Mehl, J.P.E. Jr., Jackson, J.E. (2005): Glossary of Geology – 779 S., Alexandria, Virginia (Springer Science & Business Media). ← The slow cooking of the Earth in big pots!